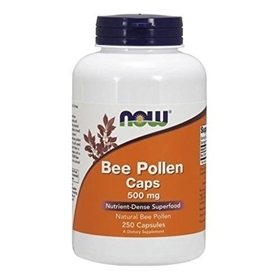 Bee Pollen is a fine powder that composes the male element of the flower. Honey bees harvesting the pollen instinctively gather only that pollen which is pure and healthy. It is then mixed with flower nectar and bee saliva to form an all-natural and highly nutritious food that contains all twenty-two of the elements composing the human body. It supplies vitamins, amino acids, trace minerals and enzymes in a synergistic balance that provides optimum bioavailability. This product helps with allergies, and is an energy booster. Suggested Usage: As a dietary supplement, take 2 capsules 1 to 3 times daily, preferably with meals. Consider taking this product in combination with NOW® Spirulina, Lecithin and CoQ10.